This past thursday night-February 23rd, as I was flipping through the TV channels, I stumbled across a program with Tavis Smiley on PBS. I was immediately attracted to the program just from the clothing of the guest on Tavis’ show and the accent seemed quite familiar—the guest was adorned in rich and detailed traditional attire worn by royalty in Ghana and the articulation was certainly coming from someone with roots in Ghana, I thought to myself. Tavis was engaged in a very captivating and educational conversation with Peggielene Bartels on the book she co-authored, “King Peggy”, in which she writes about her unique journey as a Secretary at the Ghana High Commission in Washington DC, her Royal Destiny, and the Inspiring Story of how she is making meaningful changes in the small Village of Otuam in the Central Region of Ghana. I was inspired from the onset; even after the interview ended my mind still lingered, probing deeper into why the story of Peggielene resonated so strongly with me. It occurred to me that her story touches some key issues and debates around development and progress in Africa: To begin with, as the first female ruler she is building on the precedent that is emerging for African women’s leadership at various levels of society. This story, like others where women are serving as presidents (Liberia) or are the majority in Parliament (Rwanda) are helping to transform and emphasize how women are core to development and community resilience. King Peggy is already investing in education, counseling young girls on their futures, and bringing basic amenities such as clean water to her village. 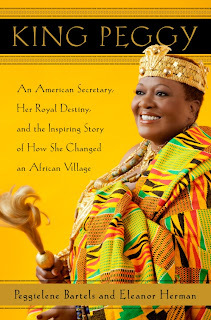 King Peggy maintains her job as a secretary despite her new duties in Ghana, which enables her to mobilize resources to support her village--Perhaps it takes a smart, diligent and humble King to do as such. King Peggy stands as a potent example of how when you educate, invest and elevate the leadership of women, development blossoms. Now more than ever, there is enough reason to invest in women because when women thrive, communities and future generations also thrive. I am also reminded that in the dialogue for development in Africa, the community-based approach to development is a very viable option that needs to be explored and employed along with various structural adjustments and macro-level strategizing. Gleaning from Peggy’s story of how she is bringing social and structural transformation to an impoverished village of 7,000 residents, it is clear that we can approach development from the ground up, one community and village at a time. With bold and visionary leadership as showcased by King Peggy, It is possible to generate alternatives that resonate powerfully with the various conversations happening around how to move the development agenda of the continent forward. In broader meaning, King Peggeliene Bartel’s story is a powerful example of how when each one of us activates our inner power, we can transform every space and every moment in which we exist. There is a king in each one of us, waiting to be awakened.